Written on November 02, 2018. Today we’ve got a little update for all of you WordPress developers! 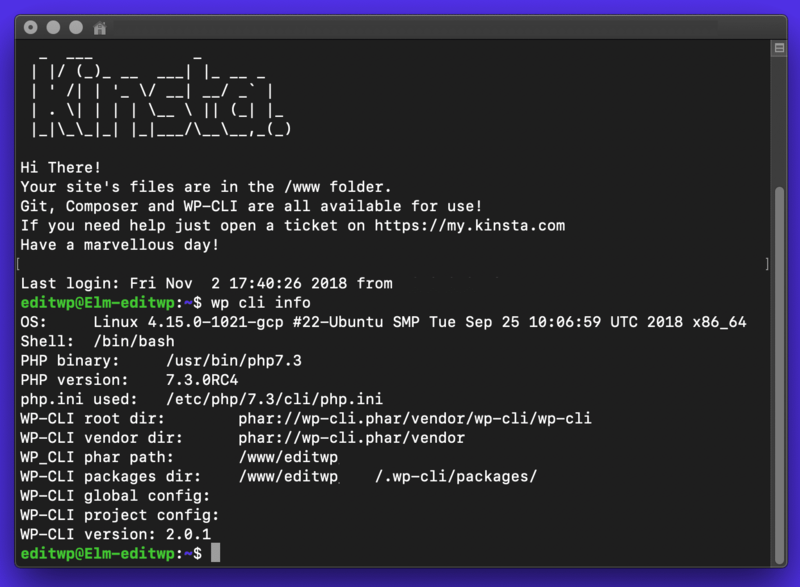 You’ll be happy to hear that WP-CLI v2.0.1 is now the default on all Kinsta servers. If you’re not familiar with WP-CLI, basically it’s a command line tool for developers to manage common tasks (and not so common) of a WordPress installation. It can add/remove users, posts, categories, insert test data, search and replace in the database, help troubleshoot performance issues, and so much more. Once you start using WP-CLI, typically you don’t want to go back. 😉Check out our in-depth post on how to manage WordPress from the terminal, along with command examples and also what’s changed between WP-CLI v1 and WP-CLI v2. Want to give it a try? Simply SSH into your Kinsta server to get started.